WA elections are only weeks away…folks are already submitting their mail-in ballots. 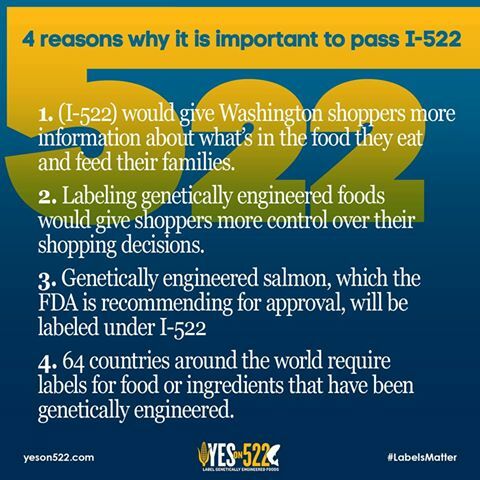 Voting YES on 522!, Washington state’s initiative measure requiring labeling of genetically engineered foods, seeds and seed products is CRUCIAL for our personal health, for generations that follow, and the environment. TV and radio airwaves, printed election materials, newspapers and magazines plus web resources are being flooded with misleading information about I-YesOn522 and GE / GMO ingredients, hiding or denying the life-threatening, chronic, health dangers already affecting the people and livestock being fed these altered foods. Leave a comment to request an emailed copy of the Swanson Report (PDF) on frightening information from the Center For Disease Control stats and graphed trends on Americans’ deteriorating health, since GE / GMO crops and widespread use of glyphosate (Monsanto’s ‘RoundUp’ weed killer) have been introduced into agriculture. Don’t be dismayed. Consumers really do have the power in our hands. Use your YesOn522 vote and buying power to choose. Refuse to buy GE / GMO containing products, which means until we have labeling….buying exclusively organic and Non-GMO Certified foods and products. By doing this, we will reach ‘the tipping point’ making products containing GE / GMO ingredients a liability. In the health food industry there is already a clear trend, according to several sources (ie. Jeffrey Smith of the Institute For Responsible Technology, the CEO of Whole Foods, and others): Product sales INCREASE by 15-30% once they’re labeled as GMO-Free or Non-GMO Certified. 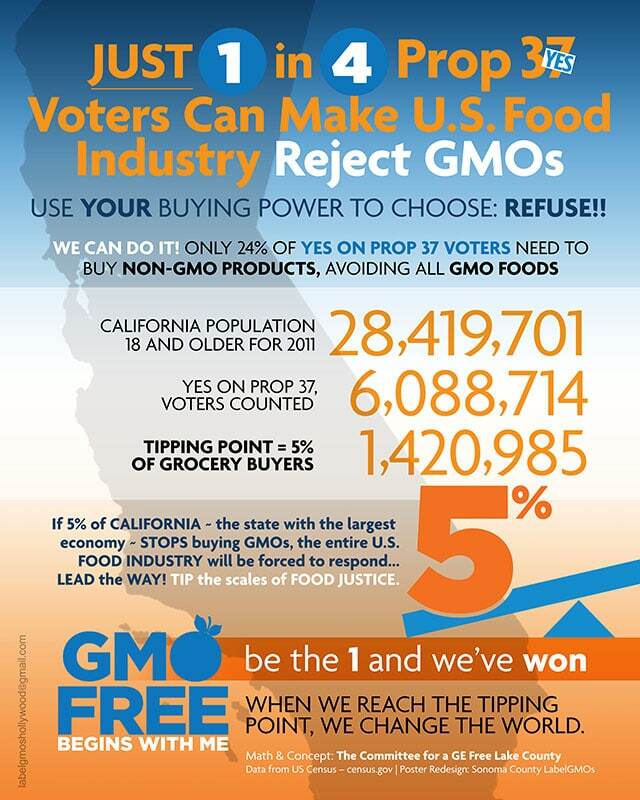 Based statistics of EU consumers, it only takes 5% of Americans to stop buying GE / GMO products to shift food manufacturers away from using them….that’s only 1 in 4 of California’s Yes on Prop37 voters. Washington ~ You can do better: Require GMO Labeling! Check out YesOn522.com to get your questions answered. Washington voters and consumers need to realize the ‘NO’ campaign is deliberately impeding your Right To Know What’s In Our Food by spending MILLIONS !! to confuse voters to defeat YesOn522. 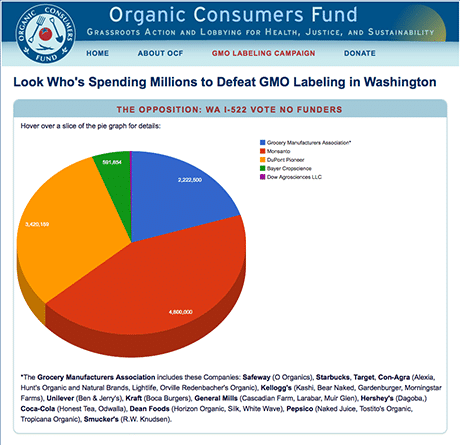 Look Who’s Spending Millions to Defeat GMO Labeling in Washington! Dirty Laundry: Who Has Something to Hide from YesOn522 Voters? Monsanto, DuPont Pioneer, GMA*, Bayer CropScience, and Dow AgroScience among others. GMA is functioning as cover for packaged food manufacturers, who want to avoid customer backlash for their unpopular stand against our consumer rights. In recent weeks, a Washington non-profit ‘Moms For Labeling’ filed a suit accusing GMA of not properly disclosing the whopping $7 million-plus in campaign funds the trade group has donated to the No on 522 campaign so far. In a court dismissal, the Moms lost their case and were penalized $10,000 plus prosecuting attorney’s fees, but now WA Attorney General has filed a similar suit against GMA’s illegal activities. According to Food Democracy Now! “In an incredible development for GMO labeling supporters in Washington state and across the U.S., today [October 16, 2013] the Washington State Attorney General, Bob Ferguson, filed a suit against this junk food mafia via the Grocery Manufacturers Association (GMA), the junk food lobbying group that has already plowed in more than $7.2 million to defeat Yes on 522, Washington’s GMO labeling initiative, and is now accused of illegally hiding donations from America’s largest food companies. What a well designed and colorful blog and how wonderful to keep it going in Bri’s memory. When I got to it I just had to watch the whole slide show before starting! 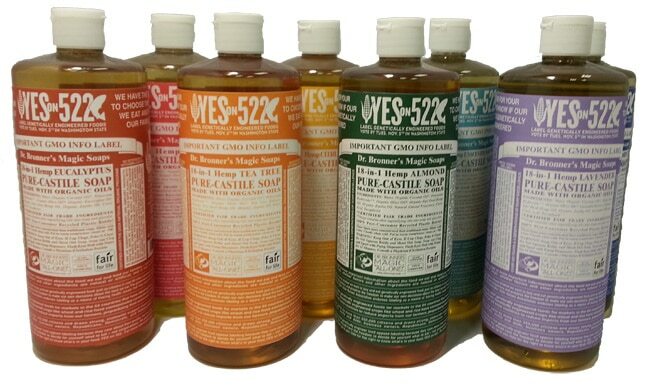 Thank you so much for your article on Yes on 522. 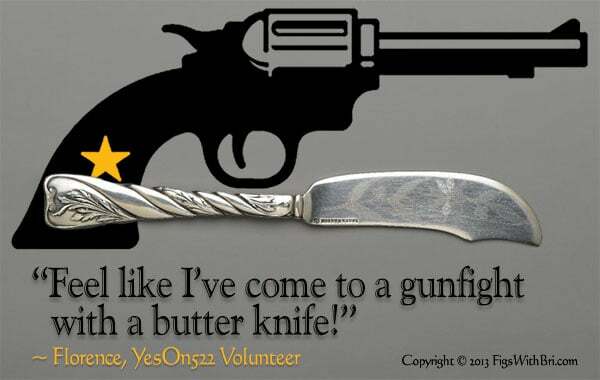 How did you make that gun and butter knife picture? It did make me laugh to see my words expressed that way! I’d like to introduce you to my niece-in-law in London. She has a great blog called Lady Aga. She’s a cake maker and has a great flair for both cakes and blogging. She travels quite a bit and includes wonderful pictures with her very dry British sense of humor. Florence ~ Glad you got a chuckle out of your frustrated spot-on comment. I actually LOVE the way that graphic came together. Many of us LabelGMOers feel that way at times, so I wanted to empower all of us, so we don’t have to wait for labeling ballots measures to get voter approval. Bottom-line: Our day-to-day purchase choices will shape the food market. Thanks for coming to make a comment! Next post: ‘Food Is Love’ 2014 Recipe Calendars: Great Holiday, Housewarming & Wedding Gifts!